yesbashtiahwrites: KFC Buntong, Ipoh. Nice place. 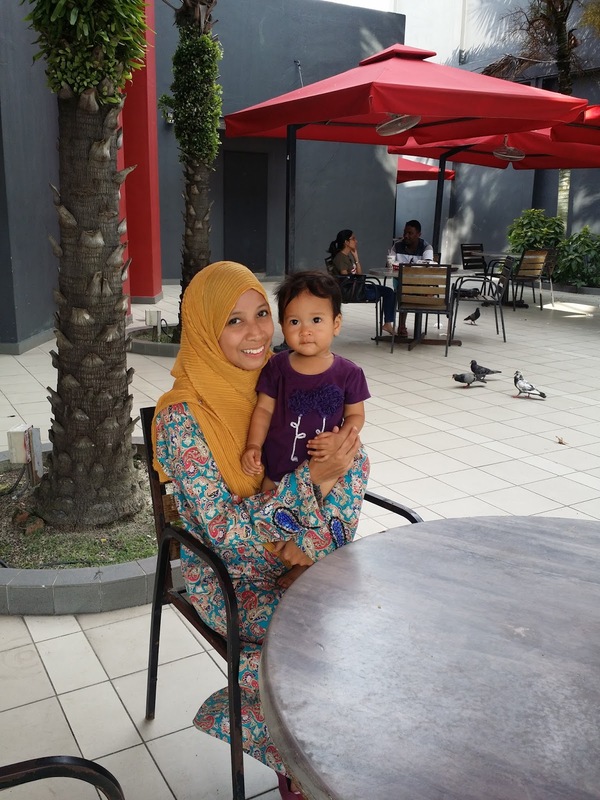 KFC Buntong, Ipoh. Nice place. Sometimes, you just have to look up from your phone to discover amazing places. My husband, Sofia, and I were at Ipoh for a wedding. Arrived at the venue around 3pm and the event already ended (read: no more food). So we decided to get something to eat. Sofia fast asleep, my husband went out to buy food. Sofia on my lap, my eyes fixed on my phone, scrolling through Hanis Zalikha's Instagram; they went to Maldives, stayed at Soneva Jani. I Google-ed Soneva Jani first, oh in Maldives rupanya... Haha. Eventually, my husband came back to the car with food. And I finally looked up from my phone. While he was reversing the car, I spotted a very nice outdoor eating area. Wait? IS THAT KFC's EATING AREA? Cool gila KFC ni! They have an outdoor eating area with red patio umbrellas! There were also a lot of pigeons eating, er.. KFC leftovers? Hahah. Anyway, we decided to just eat there. Sofia already woke up by the way (at the smell of food). Thinking it would be a great experience for Sofia since she has never been so close to a bird before. And there weren't only one, there were loads of them! And as for my side, it would be a good background for a picture. Hehe. 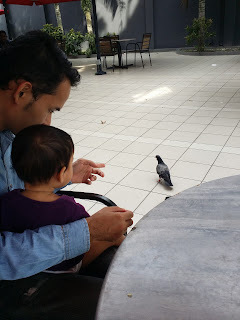 Sofia nyam-nyam dengan bird. Lots of bird pulak tu... They came closer as my husband threw bits of fish fillet on the floor. Those fish fillets were prepared by me from home earlier as a bekal for Sofia. Trust me, I think he fed the birds more than he fed Sofia. Red patio umbrellas! So cool kan? This particular KFC, the inside deco was also a bit different. It was just a small one, can't remember if it is two storey, but the outdoor space is really something cool. There. Lighting also very nice, I looked flawless. Hahahah. As we passed by the building, I noticed the building design is really made like that. There were other outdoor spaces like this along the shoplots. KFC is smart enough to utilize it. Just a side note, we came to this place on 27th August 2017. In case later on dah takde. KFC at 1st Curve, Buntong, Ipoh, Perak. Best! Especially ada burung-burung.. heheheh.